Parkinson’s disease (PD) belongs to a group of conditions called motor system disorders, which are the result of the loss of dopamine-producing brain cells. The four primary symptoms of PD are tremor, rigidity, bradykinesia, or slowness of movement; and postural instability. About 50% of patients with Parkinson’s disease experience freezing of gait (FOG), an inability to move forward while walking involved in rigidity. This can affect not only mobility but also balance. At present, there is no cure for PD, however, a variety of medications provide relief from bradykinesia, tremor and rigidity. In some cases, surgery may be appropriate if the disease doesn’t respond to drugs. A therapy called deep brain stimulation (DBS) has now been approved by the U.S. Food and Drug Administration. In DBS, electrodes are implanted into the brain and connected to a small electrical device called a pulse generator that can be externally programmed. Some problems do exist with DBS, it is highly invasive and doesn’t improve cognitive symptoms in PD and indeed may worsen them, so it is not generally used if there are signs of dementia. Now, researchers from the Sungkyunkwan University report that repetitive transcranial magnetic stimulation (rTMS) can reduce FOG and improve other motor skills in PD patients. The opensource study is published in Restorative Neurology and Neuroscience. 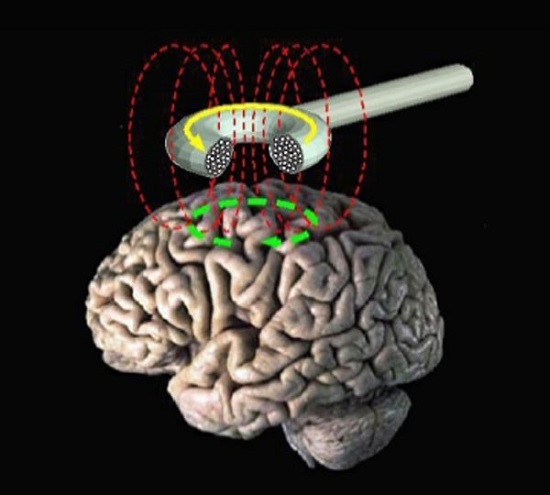 Previous studies show that Transcranial magnetic stimulation (TMS) is a non-invasive method of stimulating the brain. A coil of wire, insulated in plastic, is put on the head and each TMS pulse then produces a magnetic field that stimulates the surface of the brain beneath the coil. When TMS is used for therapy or treatment a series of pulses are applied over each part of the brain to be stimulated. A series of pulses given at a time is called repetitive transcranial magnetic stimulation (or rTMS). In earlier studies a typical treatment with rTMS consists of daily sessions (5 times a week) for 2 to 4 weeks. Each session lasts about an hour with stimulation lasting between 30-45 minutes. The lab state in the current study a magnetic stimulator was placed and 20 pulses of 10 Hz rTMS were delivered to the target motor cortex areas of the dominant hemisphere. Each pulse lasted five seconds, with 55-second intervals between pulses, delivering 1,000 pulses in 20 minutes. Placebo stimulation was conducted with a coil held at a 90 degree position in order to ensure that the magnetic field did not stimulate the motor cortex. In the current study 17 PD patients experiencing FOG were treated with either real or placebo high-frequency rTMS in five sessions over a one-week period. The location in each patient’s scalp for optimal stimulation of the anterior tibialis muscle (the front of lower leg) was mapped by stimulating the muscle and moving a pickup coil over the scalp to find the greatest response. This position was then used for each treatment. After a two-week interval, the patients in both groups were switched to the other treatment. Patients were assessed at the beginning of the study before stimulation began (pre-rTMS at day 1), immediately after the intervention (post-rTMS at day 5), and one week after cessation of the intervention (follow up at day 12). After switching, the three assessments were repeated. All medications were kept constant throughout the study and all interventions were performed at the same time of day. Both the researchers and the patients were not informed whether the real or placebo treatment was being administered. Data findings showed that five cumulative sessions a week of 10 Hz high-frequency rTMS was sufficient to alleviate FOG in patients with PD, and the effect continued for a week. Similar results were found in the motor and the gait function. The results also showed that there were no significant changes in patients experiencing the placebo treatment. The team note that very few studies have investigated the effects of rTMS on FOG. They go on to conclude that their study provides evidence that cumulative high-frequency rTMS is a good candidate as an add-on therapy for FOG in PD.